The Coal Authority is preparing to take on Kellingley Colliery's coal mining subsidence claims. The Coal Authority has today confirmed that it is preparing to take on coal mining subsidence claims related to mining at Kellingley Colliery. The Authority already manages subsidence claims for the former Hatfield Colliery, which closed earlier in the year, and has managed claims for Daw Mill Colliery following its closure in 2013. It is now getting ready to manage potential subsidence claims from property owners in Yorkshire. “The closure of Kellingley Colliery marks the end of an incredibly significant period in our country’s social and economic history. Many of our staff started their working lives in Britain’s coal mines – as miners, engineers, surveyors and other specialists – and they’re now managing the legacy that coal mining has left behind. 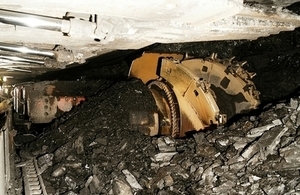 The Coal Authority will be releasing further information in the New Year about how people can claim for coal mining subsidence connected to Kellingley Colliery. In the meantime, property owners are asked to continue to contact UK Coal directly.